An ergonomic assessment of a job or workstation is an effective way to reduce the incidence and cost of workplace injuries. We solve problems in both workstation design and individual work methods by finding high impact, low cost solutions. 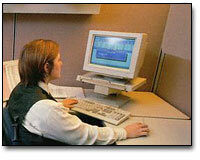 Ergonomics education is combined with on-on-one coaching to optimize the existing workstation. As a result, employees will be healthier and more productive. We provide both short and long term recommendations. We work with you to ensure the proper implementation of the recommended solutions, and our unique follow-up program ensures a successful outcome.